The Clinic provides a full assessment and management plan for Glaucoma patients. Visual Field assessment, OCT assessment , Selective Laser Trabeculoplasty (SLT) are available to patients. The staff in the CEC are committed to the continuous process of self improvement and team work development to maximize clinical benefits to our patients. 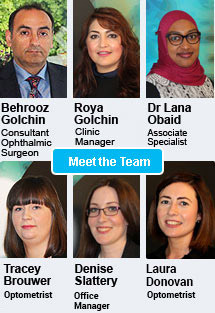 Consultant Ophthalmic Surgeon MB, BCh, BAO, FRCOphth. Mr Golchin provides a comprehensive range of treatments including Cataract and Glaucoma Surgery. We strive to provide the highest standard of care possible to our patients. Patients will be treated with dignity, respect and integrity. Suite 7&8, Cork Clinic, Western Road, Cork.